A Tank Away | Barre, Vt.
With a population just shy of 9,000, Barre is no metropolis. But its business history as national center of the granite industry, combined with an influx of young entrepreneurs opening small businesses, gives it an oddly urban feel. And with its mix of charming B&Bs, plentiful artisanal foods, outdoor activities, and unique shopping, Barre stands out as a weekend destination option. Climb the hill at the east end of downtown to the Maplecroft Bed and Breakfast (70 Washington St., www.maplecroftvermont.com, 802-477-5050, $90-$160). The 1887 Victorian’s new owners renovated this year. Along with new paint, wallpaper, and furnishings, they’ve added and upgraded bathrooms, and outfitted a professional kitchen, where they turn out a full breakfast made with local products. A five-minute drive from downtown, where East Barre and Websterville meet, you’ll find Millstone Hill (59 Little John Road, www.millstonehill.com, 802-479-1000, $40-$250). Owner Pierre Couture has fashioned two restored 19th-century barns into an assortment of lodgings that range from rustic camp style to romantic getaway. You can rent a single room or an entire building, and all have kitchen facilities. You can get Vermont artisan coffee and fresh pastries at Espresso Bueno (136 North Main St., 802-479-0896, $1.25-$2.50). The barista expertise, pumpkin-colored walls, savory scones, and comfy chairs make it inviting. Best deal in town for eat-in or take-out has got to be the Farm Fresh Market & Cafe at LACE, which stands for Local Agricultural Community Exchange (159 North Main St., www.lacevt.org, 802- 476-4276, menu items 55 cents to $7.95). Try an omelet made from local eggs and cheese, grass-fed, pasture-raised burger, or a “bottomless’’ bowl of soup, and know you’re supporting local farmers. Barre’s had a run of recent restaurant closings, but one piece of good news is Lucia’s Italian Restaurant and Bar, which opened last year (276 North Main St., 802-476-7722, pastas $9-$16.50, other entrees $15-$22). Think home-style southern Italian: baked manicotti, a mesclun salad, Red Hen organic bread, and homemade desserts. The Millstone Hill Touring and Recreation Center (34 Church Hill Road, Websterville, www.millstonetrails.com, 802-479-1000, day pass April 1-Oct. 31 $2-$8, children under age 7 free) has over 70 miles of trails and is off limits to anything with a motor. Skiing is pretty much over by late March, but the trails will soon be ready for hiking and biking the abandoned rail beds and old quarry roads. If the weather’s so-so, you can still check out the center, a former general store which now is home to several vendors selling local foods, crafts, and artwork, and exhibits on the area’s rich granite mining industry. Studio Place Arts (201 North Main St., www.studioplacearts.com, 802-479-7069, free admission) turns 10 this year. It’s a sprawling community arts center, housed in a three-story historic brick building. Inside you’ll find a vibrant enterprise, with galleries, classes, workshops, and studios for working artists. 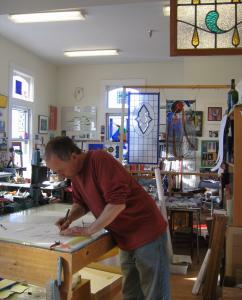 Several, like stained-glass maker Chris Jeffrey, are happy to have people stop in and watch them work. East Barre Antique Mall (133 Mill St., East Barre, 802-479-5190, free admission) is a local institution, near the intersection of Routes 302 and 110. Hundreds of vendors and consignors display their goods over three full floors and 12,000 square feet. The biggest bargains are often in the basement, so if you see something you like, make an offer. Head directly across the street and browse the Vermont Flannel Co. store (128 Mill St., East Barre, 802-476-5226, www.vermontflannel.com). The workroom, on the same property, is where they fashion bolts of plush, thick flannel into shirts, pants, nightshirts, and accessories. Barre Opera House (6 North Main St., www.barreoperahouse.org, 802-476-8188, $5-$60) was built in 1899 and shut down in the 1940s for decades. It has come back to glorious life, offering everything from big-name popular music performers to opera productions to local folk musicians. Paramount Twin Cinema (241 North Main St, www.fgbtheaters.com, 802-229-0343, $6-$8) has been in the same spot since the 1920s, and shows first-run movies on two screens. Mulligan’s Irish Pub (9 Maple Ave., 802-479-5545, $6-$13 food, $3-$5 beers) stocks lots of local Vermont beers and offers as many sporting events as you can watch on 10 high-def screens, along with occasional music nights. Gusto’s (28 Prospect St., 802-476-7919, $4-$9 appetizers, $6-$15 entrees, $5 cover for live music nights) brings rock bands from around New England on weekends. Come the end of April, they set up outdoor fire pits and bring out the horseshoes and basketball. Kathy Shorr can be reached at kshorr@mail2.gis.net.